October is National Breast Cancer Awareness Month, a time for women everywhere to increase their awareness of the disease, while learning prevention strategies and methods of early detection. The Susan G. Komen Foundation is a year-round resource for education and information for survivors, patients and the general public. 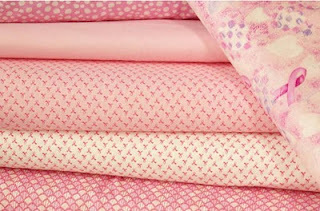 The pink ribbon has been the official symbol of breast cancer awareness since 1992. It was first used by the Susan G. Komen Foundation in 1991 at their annual race in New York City. 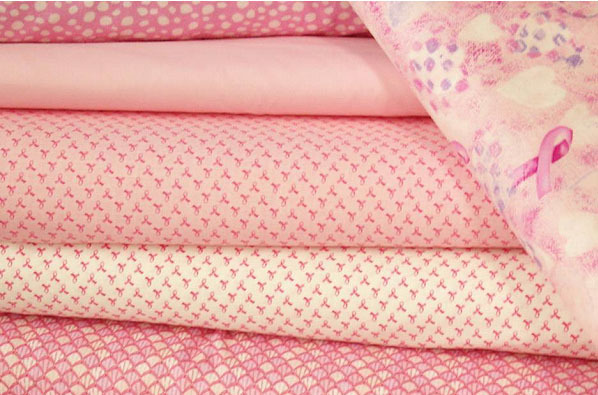 In support of National Breast Cancer Awareness Month, Beverly's is offering 25% off one cut of any regular priced fabric with pink in it (there is a limit of five yards, but just think of what you could do with all that fabric!). 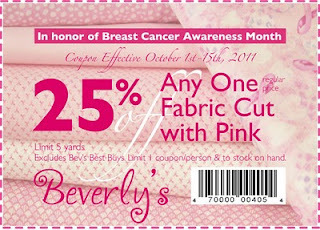 Just print the coupon below and bring it to your local Beverly's Fabrics & Crafts to receive your discount. But before you visit, make an appointment for your annual mammogram. And guys, why not remind the women in your life make their appointments? You'll be glad you did!